At last year’s OpenEd conference Viv Rolfe gave an interesting presentation on how Open Education had forgotten its past. She found that many of the early papers which explored pedagogy, the social function of open education and critical perspectives was largely unreferenced. She got talking to Irwin DeVries, and they pulled me into their side project also. We were interested in seeing whether we could in some sense ‘reclaim’ this past and broaden some of the references and understanding within the broader open education movement. 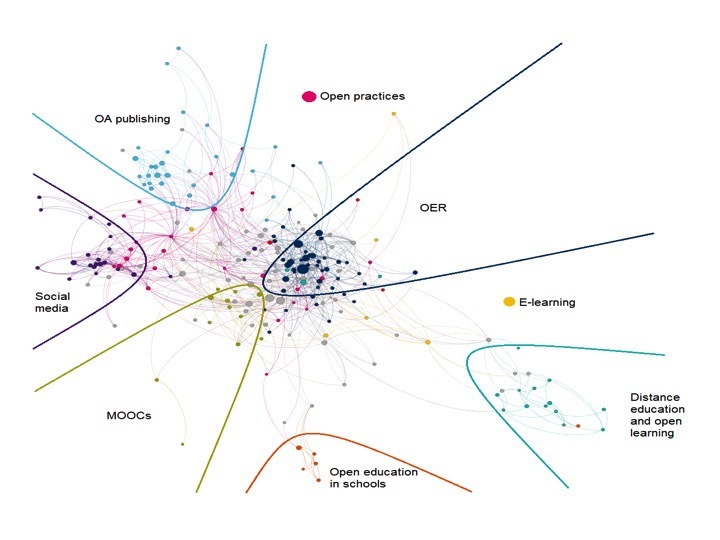 Back home I brought Katy Jordan on board, and she developed a citation analysis approach to try and map the ‘open education’ landscape. We seeded this with references, which Katy then scraped, and followed up, scraped their references, etc, and fed this into Gephi, to produce a network of citations. I’ll talk more about this in another post. From this we went back and tried to make sure we weren’t missing any large areas or key references. You can see the network that arose from this approach over on Katy’s site. The groupings in this network are highlighted below (the boundaries and labels are a subjective interpretation). There is also a timeline view. Using these groupings we then created a Beginner’s Guide, which gives an overview of the topic and summaries of some key papers in that area. We tried to provide a range of papers, not just the big hitters, and also type (eg some blog posts). This was created primarily as a resource for our GO-GN students, but I also think it’s a useful document for any researcher or practitioner who comes into open education. One of the characteristics I like about open ed is that people come to it from multiple disciplines, there are philosophers (so many philosophers :), psychologists, computer scientists, historians, educationalists, etc. But this diversity added into an area that itself is an umbrella term for many different interests as the network diagram illustrates, means that we are often missing key points of understanding. It’s our hope that the guide allows some more interdisciplinary dialogue between these different groupings and also helps those new to the area make connections between their own interest and some of the historical and theoretical underpinning (I’d also suggest it’s useful for anyone joining an open university as a staff member to know where their institution is located in this space). I’d like to emphasise this is not an attempt to create a discipline (I’ve learnt that lesson 😉 ). And there are dangers in this approach – although we tried to have a range of references, any such approach can end up reinforcing existing biases in the system. There is something of a Matthew Effect which a collection of recommended reading can only add to. We hope the network can expand and it would be useful in a next stage to take Katy’s approach and automate it so that we can seed the network with different articles to create different flavours of network, which would foreground other literature. Anyway, we hope you find the Guide, network and timeline are useful tools, which the community can build upon. Sharing this with #openedmooc. Thanks! The “discipline” question reminds me of an article by Borje Holmberg in 1986 pondering distance education as a possible emerging academic discipline http://www.ijede.ca/index.php/jde/article/view/306/200 – providing an early vision of the vastness of the field. See you at our conference on 15 February! So glad you will be there.